Labeled accessory pockets and dedicated sections for your tablet and laptop up to 17.3-inch diagonal. Internal padding for equipment, outside padding for comfort, and durable materials for longevity. Dual laptop and tablet pockets with full length laptop padding. Icon labeled pockets: mouse, keyboard, notepad/folder, adapter, and USB/cables. Make sure your gear is well-organized and protected on the go. Sleek and minimal yet rugged, this backpack is smartly designed to protect what matters most. Protects your 43.94 cm (17.3″) diagonal investment with padded panels. 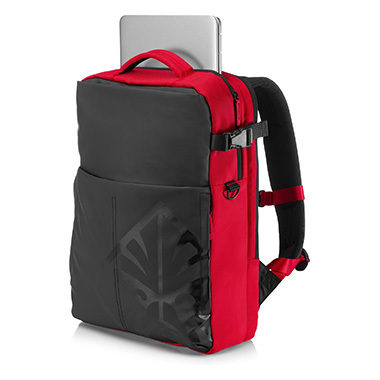 Includes dual compartments for laptop and tablet. Includes icon-labeled pockets for your mouse, keyboard, and cables with a hanging clasp to store your headset. Padded shoulder straps, plus a mesh padded back panel keep you cool and comfortable. Durable material for extreme conditions equipped with heavy-duty fabric all around, including rugged polyester on the sides and back. Extra pockets for everything, including dual concealed zipper side pockets. Zippers have pull tabs and are self-repairing for added durability.